SPECRM-36: Remove ADDRESS.as_string() and PARTY_IDENTITY.as_string() functions. SPEC-257: Correct minor typos and clarify text. Make PARTY_IDENTITY.details and ADDRESS.details mandatory in class definitions. SPEC-200: Correct Release 1.0 typographical errors. SPEC-189. Add LOCATABLE.parent. New invariant in PARTY. SPEC-194. Correct anomalies with LOCATABLE.uid. SPEC-133. Remove details /= Void invariant from PARTY. SPEC-48. Pre-release review of documents. Corrected STRUCTURE to be ITEM_STRUCTURE. Make ACTOR.languages a List not a Set. SPEC-35. Clarify circular relationships between PARTY and PARTY_REL. SPEC-3. Removed ARCHETYPED and VERSIONABLE classes. Formally validated using ISE Eiffel 5.2. Minor corrections to invariants. Review by H Frankel, MCA. Corrections to diagrams and class texts. Improved PARTY_RELATIONSHIP semantics. Added Patient instance example. Made time_validity attributes optional. Corrections to diagrams and class texts. Inheritance changed to ARCHETYPED for most key classes. Some instance examples added. General modifications, addition of CAPABILITY class. Renamed CONTACT_DESCRIPTOR to CONTACT. Removed CONTACT.role. Renamed PARTY_ROLE to ROLE. Changed CONTACT.address to addresses. Renamed SPATIAL to STRUCTURE. Introduced PARTY and ACTOR classes. This document describes the architecture of the openEHR Demographic Information Model. The semantics are drawn from previous work in GEHR, existing models in CEN 13606 and the HL7v3 RIM, and other work done in Australia. The openEHR Data Types Information Model. This specification is in the Stable state. The development version of this document can be found at https://specifications.openehr.org/releases/RM/Release-1.0.3/demographic.html. The demographic model illustrated in the UML diagram below is a generalised model of the facts one might expect to see in a demographic server. The purpose of the model is as a specification of a demographic service, either standalone, or a "wrapper" service for an existing system such as a patient master index (PMI). In the latter situation, it is used to add the required openEHR semantics, particularly versioning, to an existing service. 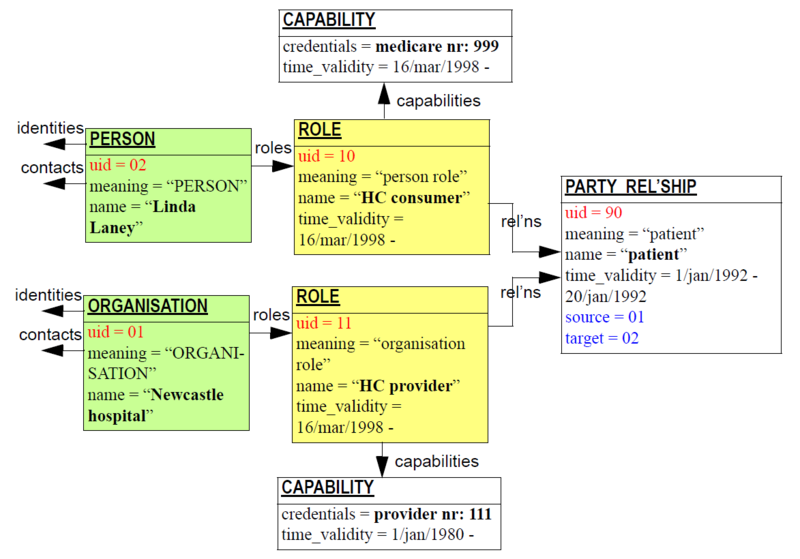 The general design is based on the scheme of party and accountability described by Fowler [Fowler_1997], and is influenced by clinical adaptations including work done in Australia and the HL7v3 RIM [HL7v3_ballot2] (itself influenced by the Fowler models). One of the main design criteria of the model is that it expresses attributes and relationships of demographic entities which exist regardless of particular clinical involvements or participations in particular events. Participations are meaningful only within the context of the health record or other relevant model where they record context-specific relationships between demographic entities and events in the real world. Another criterion is that instances of the classes in the model must be serialisable into an EHR Extract in an unambgiuous way. This requires that each PARTY be a self-contained hierarchy of data, in the same way as distinct COMPOSITIONs in the EHR model are distinct hierarchies in an Extract. In order to ensure this condition, PARTY_RELATIONSHIPs must be implemented correctly, so as to prevent endless traversal of all PARTY objects through their relationships, when serialising. See Party Relationships below for details. The model is designed to be used with archetypes, hence the generic nature of all entities. Every class containing an attribute of the form details:`STRUCTURE` is a completely archetypable structure. As a result, archetypes can be defined for concepts such as particular kinds of PERSON, ORGANISATION; for actual ROLEs such as "health care practitioner", and for party identities and addresses. Classes have been included for PARTY_IDENTITY and ADDRESS, even though they contain only a link to details, in the form of the generic STRUCTURE class. This is not strictly necessary - it could have been done simply using appropriately named attributes in the classes PARTY and CONTACT - but is done to provide a place to add specific semantics in future releases of the model. It is also expected to make software development easier, since it provides explicit classes to which behaviour and other implementation attributes can be added. Lastly, it allows the notions of PARTY_IDENTITY and ADDRESS to be explicitly used in archetype-authoring tools. Instances of PARTY_IDENTITY, linked to PARTY by the attribute identities are intended to express the names of people, organisations, and other actors - that is names which are "owned" by the party, e.g. self-declared (in the case of institutions and companies) or by virtue of social relations (names given by parents, tribes etc). Identifiers of Parties given by other organisations, or the state are not represented in this way, and should be recorded in the PARTY.details structure instead (see below). Identifiers of Parties given by organisations or the state are treated as any other attribute of a Party, i.e. recorded as part of the data in the PARTY.details structure. Identifiers of Party instances in the system are provided in the same way as identifiers of Compositions in the EHR: via the uid attribute (type OBJECT_VERSION_ID) of the containing VERSION. These identifiers are used in all cross-references between Parties, and between Parties and Party_relationships. Relationships between parties in the real world may be expressed using PARTY_RELATIONSHIP objects, as illustrated below. Relationships are considered directional, hence the use of the attribute names source and target, however, these names are otherwise neutral, and give no indication as to the meaning of the relationships, such as which party is responsible and which accountable (for comparison, see the demographic models of Fowler [Fowler_1997]). Accordingly, each Party involved in a relationship includes it in its relationships list, if it is at the source end, or in the reverse_relationships list, if at the target end. The usual way to determine the directionality of a relationship between two Parties is usually by which Party’s actions caused the relationship to come into being. For example, a relationship representing the concept "patient", between a health consumer and a health care organisation would have the consumer as source and the organisation as target. 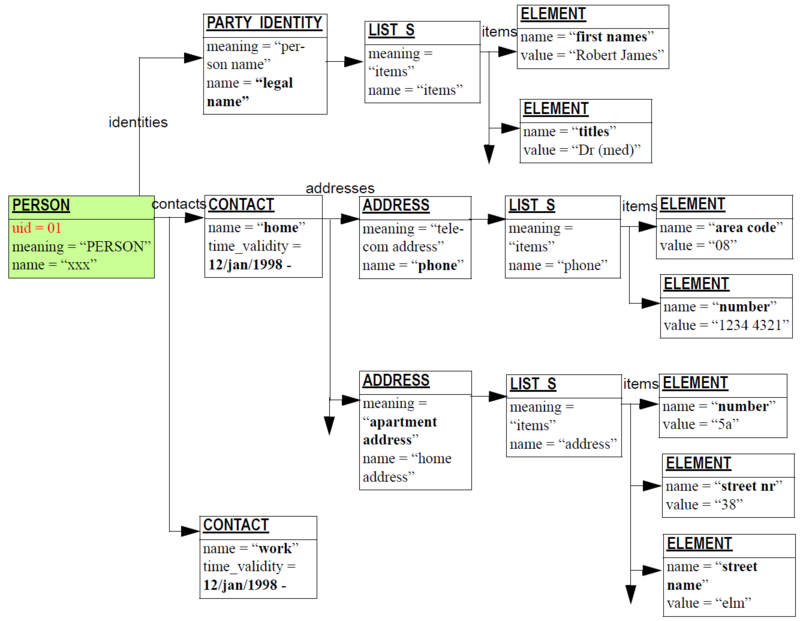 PARTY_RELATIONSHIPs are stored as part of the data of the PARTY designated as the source. This means that the relationships attribute is by value, while reverse_relationships is by references, as are PARTY_RELATIONSHIP.source and target. The actual kind of reference is via the use of OBJECT_REFs containing HIER_OBJECT_IDs to denote the Version container of a Party, rather than OBJECT_VERSION_IDs, which would denote particular versions. Logically this implements the semantic that such relationships in the real world are between continuants, i.e. the real Parties, not just one of their version instances in a demographic system. The class PARTY and its descendants ACTOR and ROLE are all potentially versioned in a demographic system. A Version of a PARTY includes all the compositional parts, such as identities, contacts, Party relatoinships of which it is the source. Every Party is stored in its own Version container. Ancestor of all party types, including real world entities and their roles. A party is any entity which can participate in an activity. The name attribute inherited from LOCATABLE is used to indicate the actual type of party (note that the actual names, i.e. identities of parties are indicated in the identities attribute, not the name attribute). Identities used by the party to identify itself, such as legal name, stage names, aliases, nicknames and so on. All other details for this party. Relationships in which this role takes part as target. Relationships in which this role takes part as source. Type of party, such as PERSON , ORGANISATION , etc. Role name, e.g. general practitioner , nurse , private citizen . Taken from inherited name attribute. Generic description of a role performed by an actor. The role corresponds to a competency of the party. Roles are used to define the responsibilities undertaken by a party for a purpose. Roles should have credentials qualifying the performer to perform the role. Valid time interval for this role. Reference to Version container of Actor playing the role. The capabilities of this role. Generic description of a relationship between parties. The detailed description of the relationship. Valid time interval for this relationship. An identity owned by a PARTY, such as a person name or company name, and which is used by the party to identify itself. Actual structure is archetyped. The value of the indentity. This will often taken the form of a parsable string or a small structure of strings. Purpose of identity, e.g. legal , stagename , nickname , tribal name , trading name . Taken from value of inherited name attribute. Description of a means of contact of a party. Actual structure is archetyped. A set of address alternatives for this purpose and time validity. Valid time interval for this contact descriptor. Purpose for which this contact is used, e.g. mail , daytime phone , etc. Taken from value of inherited name attribute. Address of contact, which may be electronic or geographic. Type of address, e.g. electronic , locality . Taken from value of inherited name attribute. Capability of a role, such as ehr modifier , health care provider . Capability should be backed up by credentials. The qualifications of the performer of the role for this capability. This might include professional qualifications and official identifications such as provider numbers etc. Valid time interval for the credentials of this capability. Ancestor of all real-world types, including people and organisations. An actor is any real-world entity capable of taking on a role. Languages which can be used to communicate with this actor, in preferred order of use (if known, else order irrelevant). 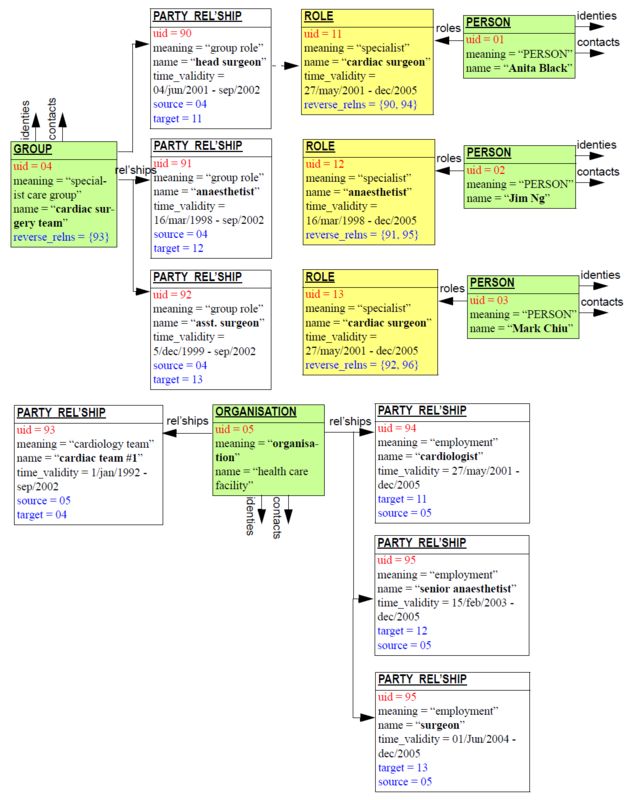 Identifiers of the Version container for each Role played by this party. Generic description of persons. Provides a dedicated type to which Person archetypes can be targeted. Generic description of organisations. An organisation is a legally constituted body whose existence (in general) outlives the existence of parties considered to be part of it. A group is a real world group of parties which is created by another party, usually an organisation, for some specific purpose. A typical clinical example is that of the specialist care team, e.g. cardiology team . The members of the group usually work together. Generic concept of any kind of agent, including devices, software systems, but not humans or organisations. In the following instance examples, the values of the attributes uid, source, target, and reverse_relationships are not meant to be taken as literally valid OBJECT_IDs - for the purposes of clarity, simple integers have been used. The diagram below illustrates a possible set of instances for a PERSON, with home and work contact information. There are separate archetypes for the PERSON, each ADDRESS, and each PARTY_IDENTITY. In the following figure, "meaning" is the meaning from the value of the archetype_node_id attribute, functionally derived from the archetype local ontology. The figure below illustrates the demographic information for a cadiac surgery team in a hospital. The group includes a head surgeon, anaesthetist, assistant surgeon, and presumably others (not shown). Each of these members of the team have an employment relationship with the hospital (shown only for one surgeon, in the interests of clarity). The figure below shows a simple way of representing the patient relationship between a person and a health care organisation. The following diagram shows the same logical relationship, but with both Parties acting through Roles, representing their status as healthcare consumer and healthcare provider respectively. Each of these Roles has associated credentials which document its official nature within the healthcare system.